In this evening class for adults and teens, we will show you how to build simple interactive systems with an Arduino micro-controller, used by millions of makers around the world. You will learn how to make lights blink, play sounds, move things — and bring it all together to create a fun interactive experience. No classes are scheduled for Arduino 101 at this time. Check our Classes listing for future courses. This workshop is for adults interested in building maker projects and developing their DIY skills. Anyone can join; no experience necessary. 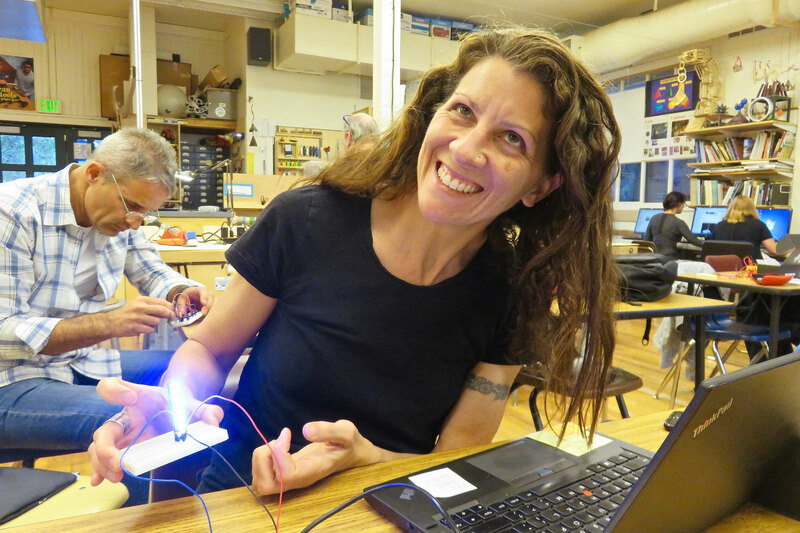 See our Arduino Workshop Guide for more details, as well as our course slides and photos. You will have access to a Windows computer, as well as a variety of soldering and other maker tools. For more details, read our Arduino 101 Guide — or view our course slides and photos. This maker course will be led by Fabrice Florin, with other members of our community. Read Fabrice’s bio and learn more about our team on our Community page. The total cost for this course is $158 per student for 2 evenings classes of 3 hours each. This includes the cost of an Arduino Uno kit and other electronic parts, which you can take home with you at the end of the course (a $52 value). Sign up here for future courses. Online registration is on the Tam High District’s Community Education site.